The mysterious past of a model village is explored via a re-discovered photo album, post cards, sound and field recordings. An exploration of the observer and the observed, Model Village is a film of illusion, scale and curiosity. Somewhere between a photograph, a document and a film, Cremer is an abstract documentation of a lost studio. It is a collaborative record and examination of the fire and resulting smoke damage that took place in the artists' studio in 2006. As film is exposed to light, the studio was exposed to smoke, leaving a shadow or imprint on all surfaces, almost like x-ray images. Whilst melancholic in tone, and a lament to the loss of the studio and all its related film elements, it also points to film's resistance to destruction. Looking at Robert Mapplethorpe’s early flower photographs, Hobbs shows that the flowers represented here are simultaneously life and death – and as such have a frequency that hums with tension. With a focused and durational gaze, each "still life" explores the visual beauty of a staged composition, while at the same time searching for moments within the frame that utilize the optical soundtrack on the film’s surface to create sonic equivalent. Here, the image is sound, and the sound is image. 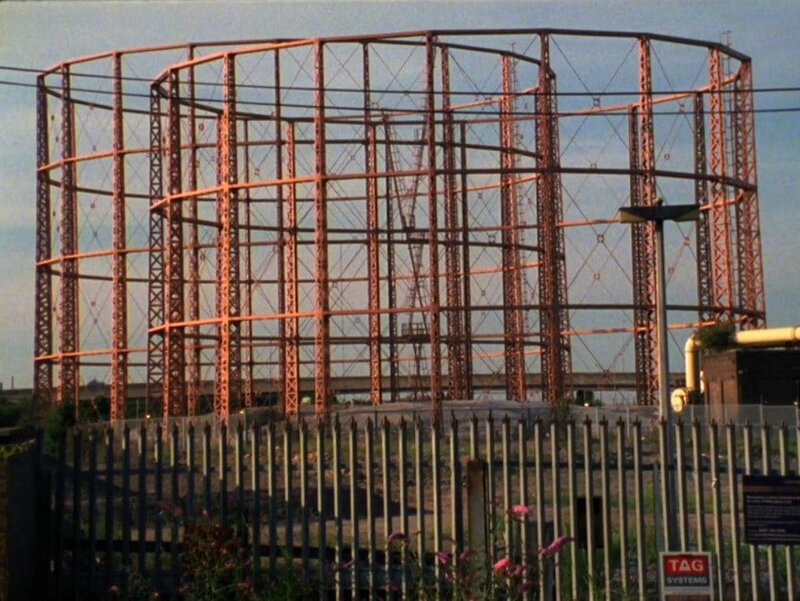 A study of a pair of redundant gas holders – Gasometers – in Ladysmith Road, North Tottenham. The film combines real-time shooting, pixillated sections and time-lapse sequences to generate a diverse and partial account of the gasometers and their demolition. A symbiosis of human and nature forms, by direct manipulation of video code, purposely damaging it in "glitch" process, creating rich explosions of colour and form. The images, a little girl in a flower field, Earth from space and bits of satellites, become vibrant substance, where the girl and the environment interact in a constant process of mutual consumption, reflecting poetic perception of existence. "The machinic phylum is materiality, natural or artificial, both simultaneously; it is matter in movement, in flux, in variation". Uploaded to Vimeo on 30 April 2016, London Republic speculates on the outcome of the EU referendum. This is a satirical fairytale – a political provocation that invites the audience to guess the outcome of the referendum to decide London's fate within Europe. There are many Londons and each has its own entwined temporalities, resonances and evolving histories. Commonwealth Archipelago traces desire lines, the personal effect on time and place, and how with each encounter the city is remade anew.